Reader Roundtable: What Do You Wear to a Virtual Business Meeting? 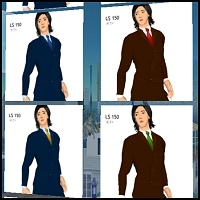 Second Life Insider has a short piece up this morning on business attire in virtual worlds. That piece links to this Information Week Blog post by Mitch Wagner, which is the most interesting thing I’ve read recently on avatar customization. I generally like that analysis, though I think it makes more sense about avatars that are being used for play. Regarding business wear, I think there’s a good argument for traditional business attire in traditional business settings — even in virtual worlds — that the SLI post overlooks. My take: a lot of people who are new to doing business in virtual worlds are pretty freaked out by what they find. In my experience, it helps put them at ease if I log on looking the same way I’d look if I were to meet them in the real world. Coincidentally, I’m writing this sitting in a coffee shop (in the real world) waiting to meet a couple of venture capital guys to talk about virtual worlds. They’re looking at a company with some tangential virtual world ties, and they want an introduction to the space. In real life, I’m wearing a blue blazer, a pair of jeans, an open-neck light blue dress shirt, and black-frame glasses. And when I log on to Second Life to show them around, my avatar (‘Benjamin Noble’) will be wearing almost exactly the same thing. In fact, the only difference is that his shirt is white. That is not by chance. I’m not sure if these guys have ever logged on to a virtual world before, but they may well not have. They are going to see avatars that appear to be theme-park mascots, leather-clad vampires, and underage strippers. I like my avatar to provide some perspective. In other words, putting ‘Benjamin Noble’ in a traditional blue blazer and making him look like I do in real life gives business people I interact with something that they recognize, and it also sends the message that not everyone views this as Disneyland or Amsterdam’s red light district. Yeah, it means my avatar doesn’t really express my creative side, but I can always create another one if I want to join a roleplaying community or do something where creativity is more important than business credibility. And I think there’s a certain amount of creativity involved in making my avatar as realistic as I can too. I think business attire has its place in virtual worlds, but I know some readers have really creative avatars and outfit them all sorts of ways, even for business meetings, so I’m making this a “Reader Roundtable” feature, and I’m specifically inviting everyone to comment. What does your avatar look like for business, and why? I count certain things like bar association meetings and interviewing SL attorney’s as business meetings. For these meetings, I typically go business casual, sweaters or shirts and pants mostly. If I need to meet with people where I need a suit, I have those available, but the need for such has not come up yet. I believe that, in keeping with my avatar, when I’m doing professionally related acts, I stay attractive but not dressing in the sexual range of so many designers in Second Life. While the designers are introducing more reasonable fashions, in a world where you can dress in silks*, professional dress is slow to keep up. *Silks are revealing outfits that a number of participants, more female than male, purchase in SL. Imagine Princess Leia as Jabba’s Prisoner in “Return of the Jedi” or John Carter of Mar’s cover art depicting Barsoom women. Hi Jessica – I suppose “client meetings” can mean a lot of things depending on exactly what business you’re in (e.g. performance acts differ from sitting down with someone to discuss a contract), so that clarification makes a lot of sense. Interestingly, it sort of goes to my point too – it sounds like the real world analog to the virtual situation is what controls. You’d not show up for a performance wearing a business suit (unless it was part of the performance) but you’d probably not wear what you wear to perform to a bar association meeting either. Just like the real world. Occasionally I’ll dress for the moment. When I visit the Gorean markets where I keep vendors I will cover myself to avoid glares from the citizens. And as an event organizer/host I’ll do my best to wear an appropriate costume. Often my dress is not dictated by where I’m going, or who I am with, but rather what clothing SL has allowed to rez and which prim attachments I can get to stick. I find it is more effective to put on the suit when I have meetings and I really want to be heard. Even though I might still have a quirky look people respond to me differently when I’m in my power suit. I think it is because I am otherwise usually dressed like a cartoon, so a suit is a visual reminder that that I mean business.